Beautiful stencils, Stencil Creme paints, and stencilling tools by Royal Design Studio of California USA. A selection of stencil products will soon be available via online shop (May 2018), email us via the Contact Us links in top or bottom website menus to inquire what patterns we have in stock. 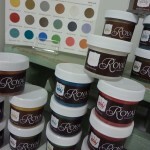 We can also place special orders for Royal Design Studio products.